Google My Business Search Result Case Study - Google plus for us! Every single day millions of people search for services on Google. Many of these searchers notice only the “3 pack” local map results and click one of the results. Which result they decide could be determined by the number of reviews, the location or even the name of the business or company. Over the last two years this local pack has gone through quite a few changes. What was once a “7 Pack” with letters is now a “3 Pack” with no distinction of ranking. Obviously, the business or company that ranks the highest will likely get the most clicks and phone calls but that is not always the case. There are a number of scenarios I have seen in which two of the three results in the local pack are businesses with five or less reviews. The other listed business has 25+ reviews which makes them seem much more reliable. 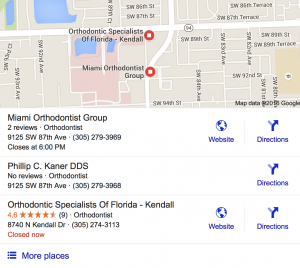 An interesting case study is the Miami Dental industry. Orthodontists are willing to fork over the big bucks to get on the front page of Google because they know a set of braces or Invisalign is a $3000-$6000 out of pocket expense for families. This means they only need one or two people to find them on the Internet to keep the business profitable. 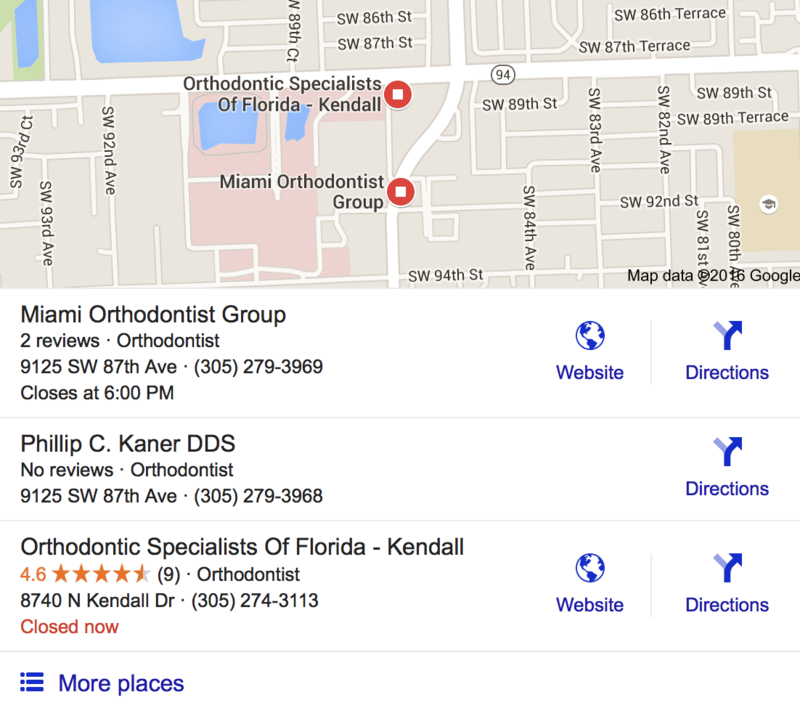 There is no rhyme or reason why Orthodontics Only would show up for “Miami Invisalign” but would not show up for “Miami Orthodontist”. We will continue to track different dental keyword phrases to see if this is common in other parts of the United States. Have you seen this happen with your dental or orthodontic practice? Have you seen local pack search results that differ so drastically from the organic search results? This could be extremely valuable for someone wanting to rank for “Dentist in Raleigh, NC” or “dental office near me”. The only thing any dentist or orthodontist can do is continue to offer great services to those in need. The reviews will come natural and their website will gain in power because natural links will flow to them. Something I suggest of all businesses is to have a blog or an updated website that can help increase the frequency of links pointing back to a specific domain. Anytime your business does something in the community or has an announcement it should be made on your website. This is a great way to improve SEO and ultimately help your business show up in the local 3-pack.